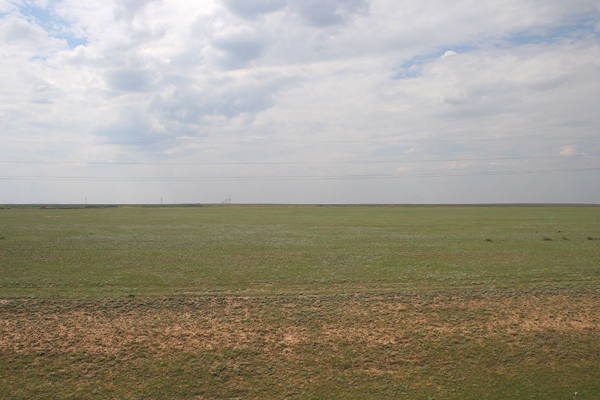 After our excellent time at the Korgalzhyn State Nature Reserve we bid a fond farewell to its gorgeous grassy terrain and made our way to a location where Sociable Lapwing were known to breed. Now, seeing Sociable Lapwing, a species that is critically endangered and thought to number roughly 11,000 individuals, would be a treat any day but to see several pairs on their breeding grounds? Well, that is almost too much to ask for! Of course, because of the fact that we were going to be on the species’ nesting ground we would not closely approach (it would be bad enough to disturb non-endangered nesting birds) but the fact that Swarovski Optik sponsored our trip meant that we had more than enough high-powered optics to enjoy watching the antics of Sociable Lapwings from a responsible distance. The night before we had learned that the lapwings preferred nesting in areas with plants of the genus Artemisia, especially when the area had been well-grazed. Often, nests are near villages, though sometimes they are found on the shores of salt lakes or on hills. It seems that they especially enjoy being around cattle, which helps lead to the number one cause of nest failure, trampling (the number two reason is predation). Above is the area where the three pairs we observed were nesting which we were told was rather typical for the species. 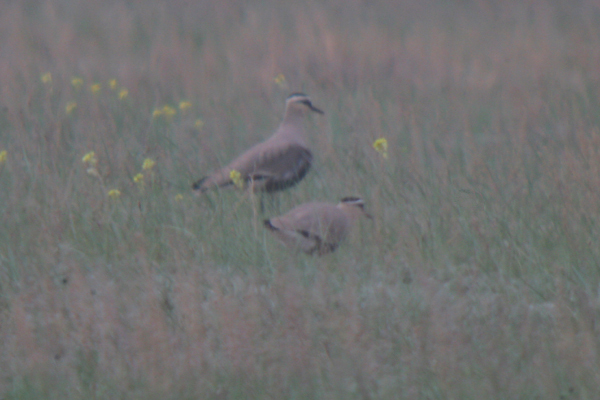 Below is one of the worst pictures ever of Sociable Lapwings. In my defense we were operating at long range and the heat waves coming off the ground in the strong sun made photography nearly impossible. It was nice just to be in the presence of such cool little birds but I wish I had gotten better shots of such a rare and awesome species. 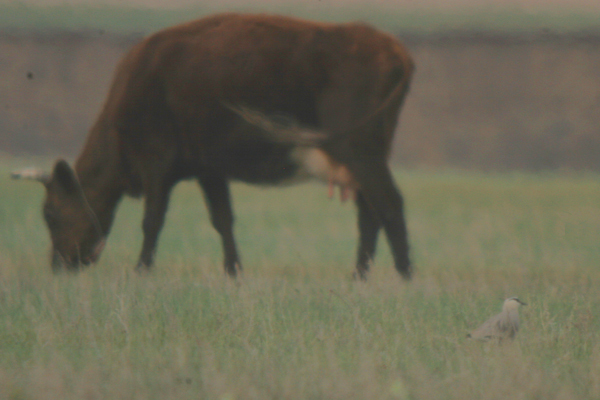 I did however, get a shot that shows the lapwing with its best friend since the wild grazers of the steppe were decimated. Bad picture aside it felt like an honor just to share a field with Sociable Lapwings, but not much of an honor considering we were also sharing the field with cows and lots of cow poop! It was truly an honor to meet the folks who are working on the Sociable Lapwing monitoring and censusing this year, including Maxim Koshkin, the coordinator of the Sociable Lapwing project for the Association for the Conservation of Biodiversity in Kazakhstan (ACBK) and is now charged with coordinating the implementation of the international Species Action Plan (he is on the left in the picture below). And who wouldn’t want to work on the ACBK’s Sociable Lapwing project? Especially when you consider that if you do you get to cruise around in the lapwing-mobile which is camouflaged in order to sneak up on the lapwings for close-range monitoring. All kidding aside I will always remember seeing the Sociable Lapwing in their habitat and hope that they are there forever, so that my grandchildren and grandchildren’s grandchildren can enjoy their presence. Fortunately, they seem to be in good hands! This post originally ran on 8 June 2009 but a day that already featured posts on Southern Lapwings and Northern Lapwings seemed like it deserved one on Sociable Lapwings as well! It is good news that more have been found this year as well.